Today, I learned a new skill…. Sewing… on a sewing machine no less. What, you ask, does this have to do with sound? Well, not much really unless you need something sewn and your wife is not around or in the mood to do it for you. She is rarely NOT in the mood to do me a favor, but in this case, she was not around. So, necessity being the mother of many things, I decided to learn how to use my wife’s brand new sewing machine… with her permission, of course. The learning process began with the DVD that came with the Brother Sewing Machine she had purchased and the production values were (shall we say) early 1970’s with voice over done by a Japanese woman who had a less than stellar command of the English language. But there were plenty of pictures and I could start and stop the DVD as often as I needed and trudged through the learning process, eventually becoming an expert. You next question is what did I need so badly, that it inspired me to learn how to sew, on a sewing machine? Transmitter belt! You know those ankle, thigh, waist and arm belts that hold a wireless transmitter in place so an actor can “do their thing” without worry of the dreaded “My mic pack fell off in the middle of the scene”. I made several passes at this project as seen in the picture below. With each pass, my technique, and understanding of the sewing machine improved. I made a Waist belt (it started out as a Thigh Belt): on that one I learned “measure twice, cut once”. Then I tried a Thigh belt: I learned that I don’t necessarily have to cut everything to size as long as I leave some elasticity in the belt. 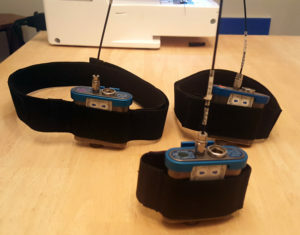 Finally I made ankle belt: I learned there are lots of other stitches that make my job easier and cover up mistakes when I don’t cut things perfectly… not to mention, folded edges, patchy looking Velcro and sketchy transmitter loops, were honed into finished edges; lots of Velcro to allow for multiple sizes in a single belt; tighter more practical transmitter holders to allow for two way placement (antenna up or down); and ultimately a fairly professional looking product. The hours I spent learning and doing this project were more about the doing rather than the finished product. If I actually calculated the time I spent, versus the money I normally charge per hour for my services, plus the materials, I am sure I spent way more than if I had called TAI Audio and ordered what I needed, shipping included. But then I wouldn’t have this fun story to tell the talent, as I wire them up: “You have the pleasure of wearing a one of a kind Steve Baker Sound Guy original transmitter belt… made with these two hands.” Since putting microphones on talent is an awkward thing to do, it’s always nice to have a fun story to break the ice. Tomorrow, I will make more belts to add to my ever growing sound kit. I’ve been thinking of some other ideas I can do with my newly acquired skill but would love to hear ideas you may have. Here a look at todays work. Comments and suggestions are welcome. PS – I’ve been kicking around the idea of doing a video blog every now and then. Kind of an informal interview thing with some of the interesting people I have met along the way. (You can’t do this for as long as I’ve been doing this and NOT meet some interesting people along the way. What do you think? As always I look forward to reading your comments and hearing about your adventures in making sound. I’ve been working in the Audio, Video and Film Industry since October of 1990… longer if you count the time I spent in Recording Studios before I officially got into the business (after going to school). I’ve made a pretty good living NOT being famous working all kinds of jobs; with big budgets and little budgets; every position from Production Assistant to Executive Producer. After reading my last post one might get the impression that I bailed out of that big job because I couldn’t hack it; because there were too many hours and not enough pay; that it was too hard for me. I’m gonna put myself out on a limb here and be honest. It was hard work! It was long hours! It was shorter turn-around times than I am used to! I am not going to deny any of that. I took the gig with the full intention of hanging around for the full run of the show. I knew up front the rate was less than I normally charge, and the offset of 67 days with overtime would likely make that rate more palatable. I really thought working as a Utility would be a good learning opportunity… and it was. What I also learned is I’m not made for that kind of work. I have always had great deal of respect for the guys who do that kind of work and wondered if I had what it takes to do it. Turns out I’m built for different stuff. I like being in the action… of a fast paced environment… driving the faders and being (pun intended) in the mix! I learned more about myself and my career aspirations in those two weeks than the entire rest of my career. What Has Steve Baker Sound Guy Been Up To? I officially joined my wife in Memphis the first week of March. I spent that first week unpacking boxes, meeting with production companies, film commissioners and generally getting my bearings in Memphis. Then I had to head back to NW Florida for some more work. I worked a day in Panama City on House Hunters (well more like a 1/2 day) with Buck Shot Productions followed by a day in Pensacola working on a 5 hour Energy Commercial with the Uso Brothers. I had a couple days off then started 4 days on an inspirational documentary about the 1st integrated Little League game in history between a team from Orlando and a team from Pensacola. Strong Films produced this on and it included a couple days shooting at Studio One in Pensacola and a bunch of time at local baseball fields around town. It was fun watching these old guys pick up the bats and balls again and relive their glory days. When that one was done, I headed back to Memphis. After a week of “recovery” I started work on a “big deal” shooting in Memphis. I can’t say much about the project due to NDA, but if you are resourceful, I am sure you can find out about a big TV show shooting in Memphis. Now… through out my career, I have avoided Feature Films and Episodic TV like the plague. But, as soon as I got to Memphis, I was offered a great job as a Utility Sound on this thing and I figured “new city, new opportunities… why not”. It paid about 1/2 my normal rate, but a lot of days and promised weekends off. After two weeks of long days, watching the mixer and boom op do what I normally do, I quickly realized… making movies and TV is hard! I really enjoyed working with the team and watching the process but I recognized pretty early on that I NEED to be “in the mix” (pun totally intended)… I need to be working. There is a big difference between being an A1 and a Utility. Don’t get me wrong, the Utility work is good work, but after driving a Mixer for 11+ years, it felt like a big step backwards… add to that the phone calls with full rate work I was turning away, it was a lot harder work than it looks. The money I was making was good, but it was a LOT of hours per week, to make what I would normally make in a couple of days. On my 9th day of 11+ hour days, I took a fall… and not a little stumble either. Someone said it looked like I was trying to “water slide” on the pavement. Wireless Transmitters went everywhere. I got no one to blame but myself and fatigue. I worked the next day, but the following Saturday, I woke up and realized “this is not good”. An x-ray revealed no broken bones, but my body was telling me something I already knew, I need to work smarter not harder. I respectfully bowed out of that gig and took a week off to recover. While lying around the house icing my Ribs, the phone started ringing and I quickly booked 3 days working on another TV Pilot for Bodega Pictures. I’m not gonna lie, I was still sore, but it felt good to be driving the mixer and swinging a boom again. The team I worked with was great and the show content has great potential. I hope to be a part of the other 9 days they plan to shoot in Memphis later this year (all indications I will be). Coming up is 2 days working for Moonshot Productions with one of Pensacola’s well know citizens. Should be a fun one. A few months ago, Derek Diamond asked me to come in and talk to him about what it’s like to be a Sound Mixer. After more than an hour we realized that I had never really talked about being a sound mixer. Here is a link to the 1st part of The Derek Diamond Experience with Steve Baker. A week or so later, Derek asked me back into the studio to actually talk about what I do as a sound mixer. Here is part 2 of The Derek Diamond Experience with Steve Baker. As a mixer on the Emerald Coast what I do is a little different than what most guys do… but not really. Check out Dereks Facebook page for a bunch of great interviews with people who are significantly more interesting than I am. It has been a long time coming, but the new website has been launched… and here it is. Thanks to the guys at Revive Media Services for all their help in getting ths bad boy launched. In the future I hope to share pictures and stories from the road as well as update my availability and equipment acquisitions. If you have any comments or thoughts about my site or just want to get in touch, please use the contact link to get in touch with me.